Optec's FocusLynx Controller has years of field experience with multiple connection methods. Capable of operating two focusers simultaneously and full ASCOM compliance, FocusLynx is the most advanced focus controller available. 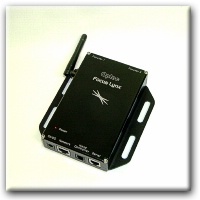 The FocusLynx Control Hub acts as the central controller to link one or two focusers to any control PC. The hub includes communication ports for Serial and USB (using Optec's USB/Serial cable) and wired Ethernet Network protocols as standard. An optional WiFi board and antenna can be added and installed at any time. Focuser 1 and Focuser 2 ports are available at the top of the FocusLynx hub with 12VDC Power, Network, optional Hand Control, and Serial connection ports available at the bottom. An optional aluminum mounting plate makes it easy to mount the FocusLynx Hub to any telescope pier or mount. Following the ASCOM Local Server model Optec's FocusLynx Commander software allows multiple clients to connect simultaneously to the FocusLynx hub. 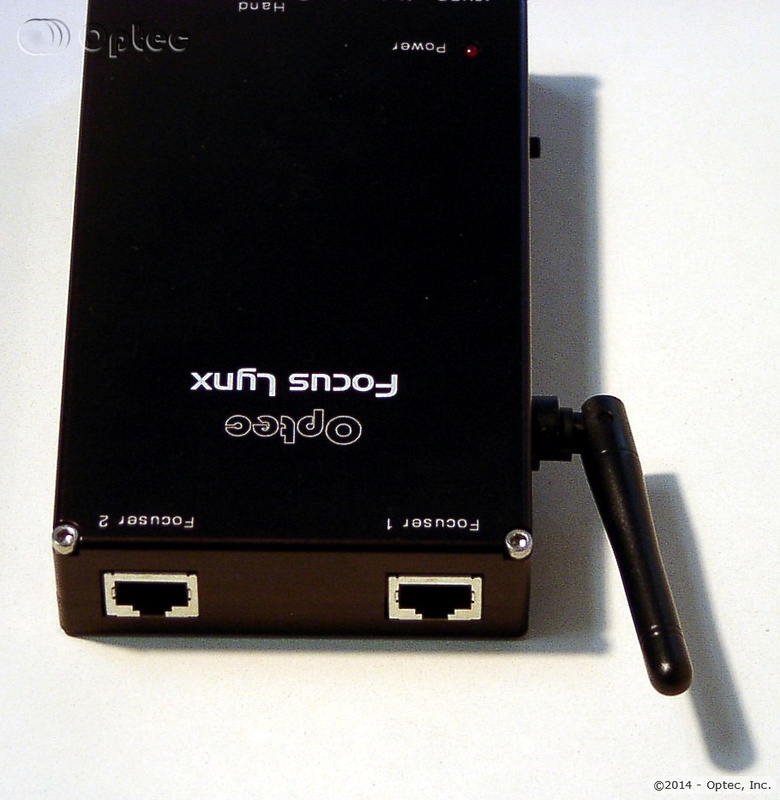 Additionally, embedded webservers in the wired Ethernet and WiFi connections allow FocusLynx to generate a control interface accessible through any web browser or smartphone. Because this page is generated and displayed by the hub itself, once you are connected, there is no further configuration required: just attach your focusers and go! The FocusLynx Control Hub can be used with a variety of focusers and focus motor add-ons. 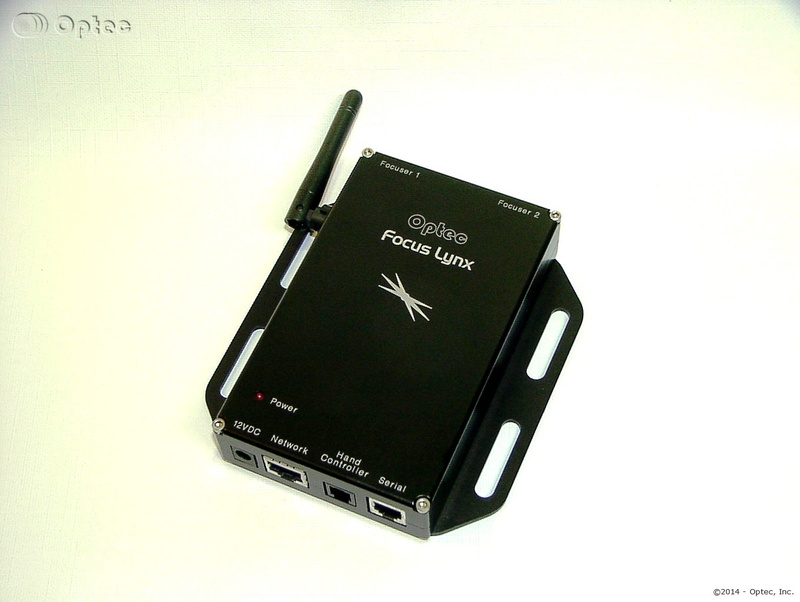 Sold as part of the TCF-Lynx, TCF-Lynx3, and FastFocus focuser packages, FocusLynx can be configured as a true absolute focus controller. Using Optec's DirectSync, QuickSync or Starlight Instrument's Handy Stepper Motor, FocusLynx can also control the TEC, FeatherTouch, Stellarvue, and other manual focusers with step counting circuitry to function as an ASCOM absolute focuser. Special cables can be used to control most unipolar motors including the MicroTouch and Robo-Focus motors. The optional second stepper daughter board allows use of the Focuser 2 port to control a second focuser of any type. 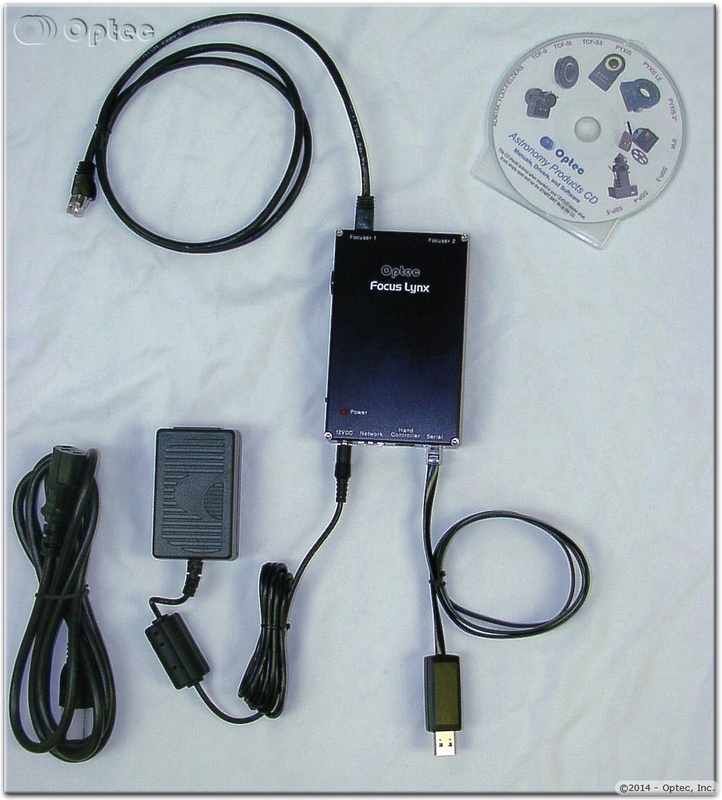 Each FocusLynx package comes complete with everything needed to connect. An optional Hand Control, WiFi add-on board, second stepper controller, mounting plate, precision external temperature probe, and motor-specific cables round out a complete integrated package. Contact Optec Sales for a system specifically configured for your telescope rig or observatory. Case Material: 6061 aluminum, anodized black. Serial: RJ12 socket for Optec USB/Serial cable (included). Order as a FocusLynx Kit or as individual components. Contact any Optec dealer, call Toll-Free 1-888-488-0381, email, or click the button below to order directly through Paypal. FocusLynx Commander Quick Start Guide. Review the FocusLynx Commander Help file. Visit the FocusLynx Commander and ASCOM driver download page. QuickSync FT digital motors for the Feathertouch family of manual focusers. Add a second stepper controller board and QuickSync FT to control two focusers at the same time. DirectSync TEC digital motors for the TEC Large Focuser. Add a second stepper controller board and DirectSync TEC to control two focusers at the same time. The #19695 FocusLynx Hand Control with Digital Read-Out allows vibration-free control of the QuickSync and other FocusLynx focusers while at the telescope. Click here for additional information. The #19533 FocusLynx Second Stepper Driver board converts the standard FocusLynx controller into a Dual-Focus Controller. Order as part of a FocusLynx kit or click here to order separately. The #19535 FocusLynx 802.11 WiFi wireless networking option eliminates the need for any communication wires to the control PC, Smartphone or tablet. Click here for ordering information. The #19539 FocusLynx External Temperature Probe Kit is available for imagers preferring to have the temperature probe placed directly against the OTA tube for a more precise measurement. Click here for more details. The #19691 FocusLynx Mounting Bracket allows an easy way to permanently mount your FocusLynx Controller. Click here for more detail and ordering information. Optec,Inc. © 1996, 2019 | All Rights Reserved.